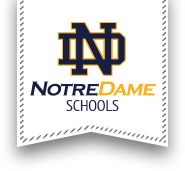 Notre Dame is accredited by the Middle States Association of Colleges and Schools (MSACS). MSACS is a non-governmental, nationally recognized organization whose members include elementary schools through collegiate institutions offering post-graduate instruction. Accreditation of an institution by the Association indicates that it meets or exceeds criteria for the assessment of institutional quality periodically applied through a peer review process. An accredited school or college/university is one which has available the necessary resources to achieve its stated purposes through appropriate educational programs, is substantially doing so, and gives clear evidence that it will continue to do so in the foreseeable future.